Photo by WRCB-TV Channel 3 /Times Free Press. 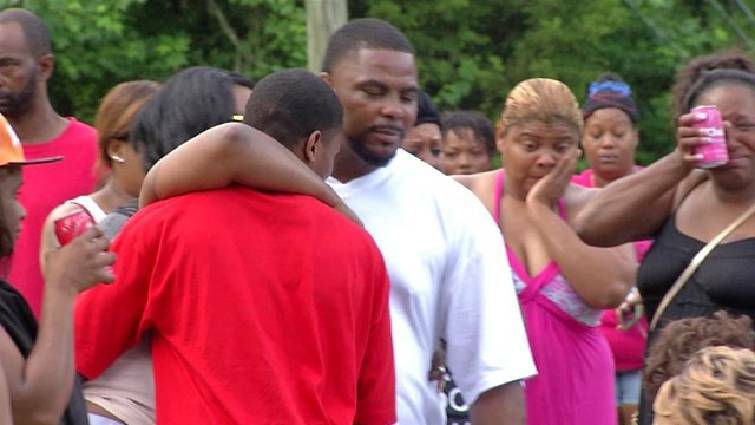 Cars streamed to the 5100 block of Woodland View Circle in Alton Park on Sunday as family and friends gathered to remember the life of a woman they said was one of the most beloved residents of Emma Wheeler Homes who was shot to death earlier in the day. Police had not released the identity of the woman, who suffered multiple gunshot wounds to her chest, but neighbors and one woman who said the victim was her older sister were distraught over the loss of the 40-year-old mother of five. The woman was known as the "candy lady" and godmother to residents of the Emma Wheeler neighborhood and throughout inner-city Chattanooga, neighbors and friends said. Hundreds of people visited the house at 5138 Woodland View Circle and comforted one another as they tried to make sense of the violence. Chattanooga police officers got a call about 5 a.m. Sunday on a possible person shot. The victim was pronounced dead at the scene by emergency medical personnel, according to police reports. LaShonda Wooten, who said she is the younger sister of the victim, and other friends of the victim said they believe they know who shot the woman. Wooten, who lives in Nashville, said police have a warrant for a man's arrest, but police did not confirm that information by press time. Leslie Cross, who identified herself as the victim's best friend, paid tribute to her friend and the impact she had on her community. She took care of Wheeler Homes. She cooked for the whole community, Cross said. She cried when talking about what she will miss most about her friend. "She was there for me. She listened to me, never judged me," said Cross. "She was my ear when I couldn't talk to my mother." Sunday's shooting death marks the city's 11th this year. Police said their investigation is ongoing. Anyone with information is asked to call 698-2525.